2 New mid height bunk bed designs! New bunk bed with optional trundle comes in two different heights! What is the recommended mattress thickness for our bunk beds? Spacesaver low height loft bed - Pretty in pink! We are please to announce not 1 but 2 mid height bunk beds coming soon! Over the last few months we have been researching and designing some bunk bed designs to add to our already extensive rand of single and mid height cabin / loft style single beds. At the end of last year we built examples of the new designs and they have been in daily use by our test customers and the results have been really positive so we are ready and really looking forward to releasing these new designs for sale generally when we reopen the factory and our sales office in Early 2016. 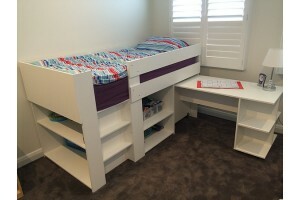 The two designs are both mid height low bunk beds, we have found that these are most popular by parents as due to the low height of the top bunk they are much safer than conventional height bunk beds. The difference between them is one has a built in compact ladder on the front, maximising floor space, while the other has a easy climb wide step ladder on the end integrated together with a bookcase built into the end of the bed. 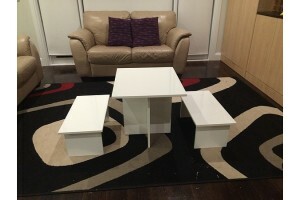 New kids Table and bench design! We have recently released a new design for our our range of kids furniture. It includes an oblong re..
Spacesaver Compact mid sleeper bed - Now available in 8 different variations! Our Popular Spacesaver compact bed is now available in 8 - 24 different variations!..